You probably know that the Earth’s surface is a little over 70 percent water, but did you know that the percentage of water in your body is between 50 and 75 percent? It’s more likely 60 percent for men and 55 percent for women. While you may think it’s an interesting fact to squirrel away for your next trivia night, hydration, or more accurately dehydration, is actually serious business. This month, we’re drawing your attention to the issue because June 23 is National Hydration Day. Most of us are dehydrated without even knowing it, but our bodies do. Early on, dehydration manifests itself through thirst, flushed skin, fatigue and other body responses like temperature. Later, individuals who are dehydrated may experience dizziness, weakness and more labored breathing. The effects of dehydration also manifest in decreased mental performance and physical coordination, and may also affect body temperature control, metabolism, joint lubrication and toxin elimination because every cell and body part needs water to work at optimal level. According to the Centers for Disease Control, less than 50 percent of Americans consume enough water in a day. 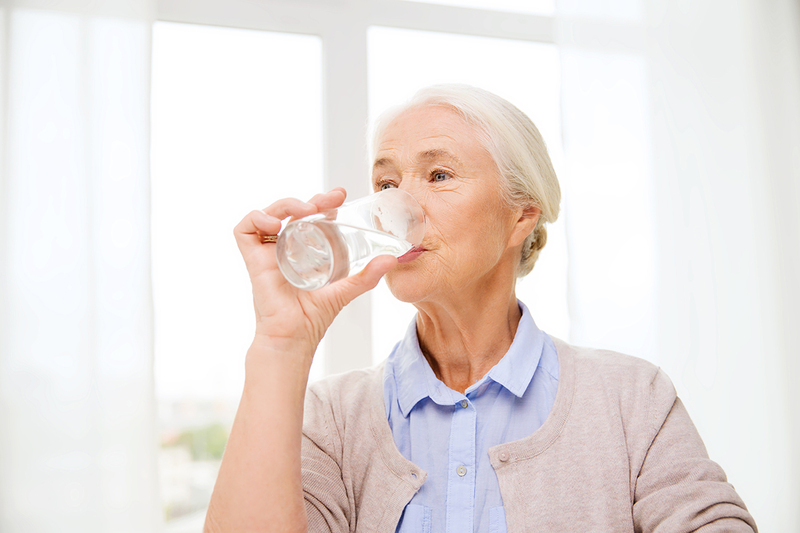 For seniors, who may lose their thirst triggers, dehydration can land them in the hospital as their body fights to supply fluids to their organs. They can experience an increased heart rate, rapid breathing, headaches, nausea, confusion, fatigue, cramps and muscle weakness that could lead to falls. They can also be at risk of heat exhaustion and heat stroke since they aren’t as likely to sweat. Severe dehydration can be fatal. So, in honor of National Hydration Day, and as summer heats up, we encourage you to drink up – at least 64 ounces of non-caffeinated beverages daily to prevent problems associated with dehydration. Eating plenty of fruits and vegetables will help with hydration as well. Our specialized programs are designed to improve recovery, encourage independence and promote a return to the highest quality of life. For more information, contact us today at 925.271.9100 or visit us online.